Garmin rolled out the G3X budget EFIS for the light sport and experimental aircraft crowd. Kitplanes' Marc Cook gives us an inside look. 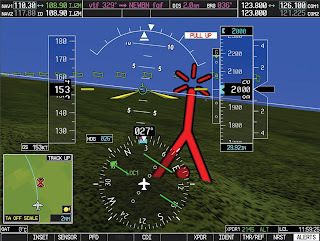 EFIS in light aircraft is approaching its eight-year anniversary, and all I can say is, you’ve come a long way, baby. Just this past month I had the opportunity to fly, guided by one of the most elegant systems just now available, the Garmin G1000 SVT, plumbed into a Diamond DA40 XLS being offered by Premier Aircraft Sales, Inc. at Fort Lauderdale Executive Airport (FXE), in South Florida. The Diamond is anything but a kit aircraft, but it did have the new software upgrade, the very same upgrade that will be shown in a Garmin G900X in a few weeks at the EAA AirVenture show, according to Garmin sources. So from that perspective you could say that flying it in the DA40 XLS G1000 configuration offers a good idea of how the SVT software will behave in the G900X setup. Whatever the rationalization, I can say that the trip was worth the time. The system is drop dead gorgeous to look at. Sure, the JepView Taxi program is cool, but I can see that on my portable Anywhere Map display for a lot less (albeit on a much smaller screen). And it was cool to see the runway roll into position in front of me on the 1024x860 pixel screen, with numbers and markings in place. Could I take off heads down, without even looking out, using only the high-resolution graphics? Yes, yes, it was beautiful. The grids across the flat Florida landscape helped with the 3D effect, too. That wasn’t what got me, though. What got me was the 3D presentation of both obstacles (the church steeple ahead painted as a red, and then as I climbed out, yellow tower clear as day in front of me) and the TIS traffic. The traffic floats, as white, then yellow and even red triangles on the blue of the virtual sky. If you see a dot threatening on your screen, it is in exactly the position where you will see the traffic when you look out the window. It just doesn’t get any easier to spot threats. Only Chelton paints the traffic in 3D that way, but with a smaller screen it is hard to see. The obstacles and terrain I’ve seen on many systems (Garmin does a great job with its presentation), and those functions in an SVT that is a $9000 to $10,000 add-on are nothing new. (The voice prompts to “pull up” are nice, I’ll admit.) But on the other hand, the traffic right where I need it on a big, beautiful display actually made the aircraft’s TIS system intuitive to me. What else do you get for your ten grand? Flight director, a gorgeous HITS that is cued on the ILS...all good stuff. If you’ve already bought into the G900X, I’d see it as a worthy upgrade. It will certainly tame the Chelton crowd a bit (after all, they did synthetic vision first, and still do it very affordably). 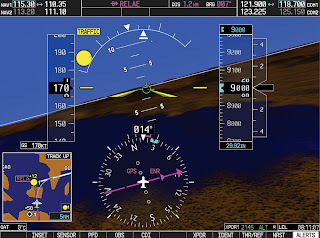 I believe that the up and coming Grand Rapids Technology Horizon HX is a good low-cost alternative, if you are looking for high-resolution synthetic vision and can live without the avionics integration, as are the Blue Mountain Avionics products. AirVenture may reveal a couple of other possibilities, so stay tuned. As for me, I’ll continue flying behind my Grand Rapids Technology Horizon I screens for the time being. They may be smaller and low resolution and a couple of years behind in terms of “box” technology, but the software continues to impress me with all of the high-end features that hide behind a simple button-push or two.